VietNamNet Bridge - Over the past two months, the price of Tra fish – one of Vietnam’s major seafood exports – has fallen dramatically, causing a big worry for breeders in the Mekong River delta. Many fear that they will incur heavy losses during this year’s fishing season if they do not find a long-term solution. To support breeders, the State Bank of Vietnam has recently asked commercial banks to continue providing capital for businesses to purchase the fish and extend the deadline for loan repayments. Since the start of June, commercial banks have provided capital for businesses to purchase aging Tra fish from farmers. However, Le Van Tho, director of the Bank for Agriculture and Rural Development of Vietnam (Agribank) branch in Can Tho City says that the bank is finding it difficult to meet the demand from businesses and breeders for capital due to capital shortages and will only provide loans to businesses that have established credit relations with the bank. Meanwhile, the Agribank branch in An Giang province has disbursed VND200 billion to businesses to buy 20,000 tonnes of Tra fish stocks and 10,000 extra tonnes of Tra fish that weighs more than 1 kilo each. The branch has also supported Tra fish breeders in financial difficulties with VND35 billion to stabilise their businesses. However, to buy the fish, businesses say that they need at least VND2,000 billion from banks. Due to capital shortages, businesses have only focused on purchasing large Tra fish as they are preferred by the consumer. Vo Dong Duc, general director of Can Tho Seafood Import-Export Joint Stock Company (Caseamex) says that his company is giving priority to large Tra fish for their export! contrac ts. Currently, not only breeders but also processing factories, fish food suppliers and banks are at the risk of going bankrupt. Many suppliers are ready to provide credit to processors and breeders to maintain the industry. Ngo Phuoc Hau, general director of the An Giang Seafood Import-Export Company (Agifish) says that a supplier even agreed to lend his company VND30 billion underwritten by the Bank for Foreign Trade of Vietnam (Vietcombank). “If the State provides more financial assistance, we will buy up the older fish in July,” Mr Hau adds. Measures to assist businesses and breeders are beginning to pay off. The Tra fish market has bounced back since June 5, with fish prices increasing slightly. Despite suffering losses, breeders are still hopeful about a profitable breeding season coming soon. In addition, affiliated companies under the Vietnam Association of Seafood Exporters and Processors (VASEP) have agreed to maintain the floor prices of Tra fish to stabilise the market. Vietnamese seafood products, mostly coming from the Mekong River delta, have been known worldwide for at least 13 years. However, VASEP vice president Nguyen Huu Dung says that Vietnam has yet to develop a professional marketing programme for Tra fish. “The breeding and processing of Tra fish in Vietnam has so far developed in a haphazard fashion in the Mekong River delta,” says Mr Dung. “Farmers have dug ponds while businesses have built export processing plants themselves without any planning in advance or professional management skills. As a result, Tra fish prices have fluctuated unexpectedly, causing losses to both farmers and export businesses. 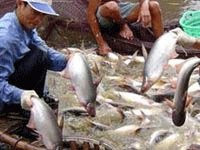 In the long-term, Nguyen Minh Toai, Vice Chairman of Thot Not district People’s Committee in Can Tho city, says that the Government needs to tighten the management of the Tra fish farming and processing industry to stabilise the market p! rice of this species of fish. In addition, the relevant agencies need to develop a set of criteria for sustainable Tra fish farming, along with increasing the quality of Tra fish for export and promoting its products in the world market.